The I-O Corporation 5760e SCS Printer Gateway is a high speed Ethernet-in, Ethernet-out SCS gateway print server designed to convert native IBM Power8, Power7, iSeries AS/400 i5 or zSeries S/390 zSeries host print jobs to PCL, allowing them to be printed by almost any printer (laser, matrix, thermal) on the Network. 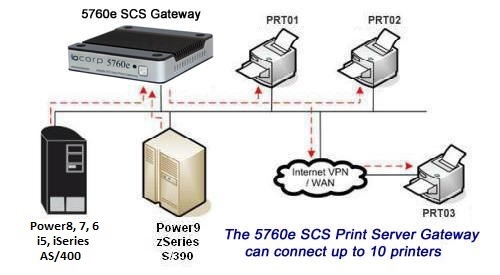 The 5760e Print Server Gateway can be initially ordered with support from 1 to 10 printers, and delivers IBM SCS printing via TCP/IP, providing the control and printer feedback found in an IBM host environment. When additional printer support is needed, it is simply upgraded via a new license code. Host controlled printing, including Forms Alignment Messages, Page Range Printing etc. Attached to a network, the 5760e supports almost any network attached printer. It supports printing up to 250 pages/min per printer. Whether printing from an IBM Power System (System i, iSeries, AS/400) or a zSeries - S/390, fast printing can be obtained with laser printers supporting port 9100. In addition to the Ethernet gateway connection, the adaptio Gateway will also support one locally attached USB printer. The 5760e offers the same reliable, full-function IBM host printing and control found with traditional direct attached Twinax/Coax printers. With the 5760e Print Server Gateway your printers are configured as true "Device" printers and not "Remote Out Queue Printers". Your IBM host print jobs are not lost in the black hole of "Remote Out Queue" LAN printing. The 5760e provides bi-directional communication between the printer and the IBM host, allowing error reporting and page range printing. Simultaneous Multi-Host Printing - Maximizes printer utilization by supporting concurrent printing not only from the IBM Hosts but from Windows, UNIX, etc. I-O's Configuration Utility software is included with every 5760e. Configuration is made easy through the use of a menu-based utility. Windows Printers: Laser and Dot-matrix via output. Data conversion is accomplished at the 5760e Gateway and sent to the printer via the Ethernet Network. The Adaptio Gateway takes advantage of high-speed, high-performance printers. Up to ten (10) printers can be configured as SCS virtual printers. IBM host printing to network attached printers. Laser Printers/Copiers/MFPs can be configured as SCS Printers. The 5760e Gateway provides a bi-directional communication between the host and the printer, via port 9100 and PJL commands. The printers can be attached locally or remotely via a WAN or VPN network. Printers do not need to be directly attached or physically next to the 5760e Gateway. One printer can be directly attached to the 5760e Gateway for IBM host print jobs. All functions such as True Print Complete, SCS Duplex, Page Offset, COR, Fonts, Barcode, are fully supported by the 5760e Gateway.